A dustpan is a cleaning utensil, commonly used in combination with a broom or brush. The dustpan may appear to be a type of flat scoop. It is often hand held for home use, but industrial and commercial enterprises often use a hinged variety on the end of a stick to prevent the user from constantly stooping to use it. 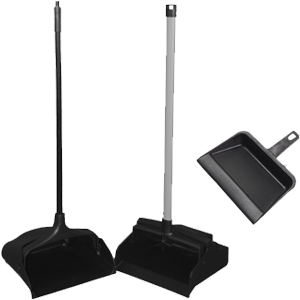 Handheld dustpans may be used with either a full-size broom or with a smaller whisk broom or brush sometimes called a duster.